1. Get sikuli-script.jar from your Sikuli IDE installation path. 3. Include sikuli-script.jar in the CLASSPATH of your Java project. The core of Sikuli Script is written in Java, which means you can use Sikuli Script as a standard JAVA library in your program. This document lets you know how to do that. Sikuli Script is packed in a JAR file - sikuli-script.jar. Depending on the operating system you use, you can find the sikuli-script.jar in according places. There is a new environment variable %SIKULI_HOME% that is expected to contain the directory, where Sikuli X is installed. You have to set it, if you have Sikuli X in a different place. Be aware: using the zipped version, you have to take care for %PATH% and %SIKULI_HOME% yourself. Mac: have Sikuli-IDE.app in its standard place /Applications. There is generally no need to put it elsewhere. Linux: you generally have to take care for the environment yourself. We use Eclipse as an example. 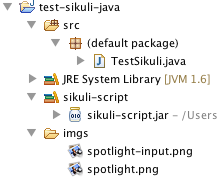 After adding sikuli-script.jar as a library into your project, the project hierarchy should look like this. You can simply “import org.sikuli.script. *” or import the classes you need. In most cases, you would need at least Region or Screen. Changed in version X-1.0: In the version 0.9.x and 0.10.x, the package name was edu.mit.csail.uid. Here is a hello world example on Mac. The program clicks on the spotlight icon on the screen, waits spotlight’s input window appears, and then types “hello world” and hits ENTER. Be aware, that some method signatures differ from the Sikuli Script level.